Ultimate Action... It’s the best way to describe the thrill of a Pitts Special Aerobatic Flight! The significant advantage to the Pitts is that it is light and easy to manoeuvre in the air. Enjoy this "Pitts Special" Aerobatic flight with a combination of speed, air-show style aerobatic manoeuvres and adrenalin - an experience of ultimate action! Your flight includes a short briefing and then straight into the flying, jam-packed with aerobatics. The recipient will be given the opportunity to enjoy some real hands-on flying experience, along with some hair-raising roller coaster aerobatics. 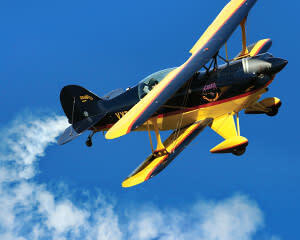 The "Pitts Special" aircraft is considered one of the most popular aerobatic planes in the world. The significant advantage to the Pitts is that it is light and easy to manoeuvre - when in the air, in aerobatic flight, the Pitts is hard to beat. Let us show you the world from a different perspective! Flights available 7 days a week, contact us to book now! The Pitts Special is part of American aviation history. The Pitts Special was designed by Curtis Pitts and is acknowledged as one of the world's leading competition aerobatic and airshow display aeroplanes. The Pitts has won more aerobatic competitions than any other aeroplane in history. It is the only fully FAA Certified competition aeroplane made in America. This particular aircraft is an S2B model, a two-place aeroplane capable to enter the "unlimited category" competition. Please note that this experience is weather dependent and will be cancelled if the weather is not suitable. The flight was very professionally conducted and I had a fantastic experience. Many thanks to my pilot Ken. I rock climb, snowboard, scuba dive and generally seek out any adrenalin filled activity I can find. This however was hands down the most intense and amazing thing that I have ever done. I couldn't recommend it enough. A great experience - take a go pro! Loved every minute of it, brilliant pilot, can't wait to go back! Fantastic experience...got to fly the plane and even do a loop myself. Great pilot who certainly showed me what the plane could do. A-grade experience that exceeded expectations! It was a fantastic experience and I would definitely recommend this to my friends. Awesome experience. Thought the theme park rides were the only place you could experience these G-Forces and rolls, but this flight went even further! For those into this kind of thing, you've got to do it.